Beyond this basic assurance of continuity, the meeting demonstrated that there was “good chemistry” in the personal relationship between Trump and Modi. There were even Modi-Trump “bear hugs” to prove this chemistry. In addition to the positive signals from the executive branch, there has long been strong bipartisan support for the U.S.-India relationship in the U.S. Congress. Legislation to implement the U.S.-India civil nuclear deal was crafted on a bipartisan basis. The Senate Caucus on India and the House Caucus on India and Indian-Americans are, respectively, the largest bipartisan caucuses in the two legislative bodies. Last year Republican Speaker Paul Ryan invited Modi to address a joint session of Congress when the prime minister was in Washington primarily to visit Democratic President Barack Obama. Modi gave an excellent exposition of the reasons for the U.S.-India partnership. His speech was widely praised by Republicans and Democrats alike. Now is the time for the Congress to put forth a positive legislative agenda that will coincide with the administration’s positive view of India. The stars are aligned to make it possible for U.S.-India policy to be one of the few areas in which there is across-the-board, bipartisan agreement in the executive and legislative branches of the national government. Congress should grasp this opportunity. Active congressional involvement will help drive U.S.-India relations toward permanent strengthening of the partnership. At the Trump-Modi summit, reassurance and camaraderie were achieved at the cost of avoiding contentious issues. One could foresee situations in which Trump’s tweets or other actions could wind up derailing the progress that has been made. Such a situation occurred temporarily during the Obama administration over U.S. treatment of an Indian deputy consul general. Trump’s preference for bilateral transactional approaches to trade deficits or any one of a number of other issues could develop into controversies that would affect the strategic relations between the world’s two largest democracies. Congress, acting positively, could help assure that this does not occur. In the American system, international relations are not the exclusive domain of the executive branch. The Constitution empowers Congress to provide for the common defense, regulate commerce with foreign nations, impose duties, and declare war. Congress has the power of the purse and the Senate is to advise and consent on treaties and appointments. The Congress makes all laws for carrying into execution the powers of the United States. Thus, constitutionally, it is necessary that Congress take a strong role in international matters. Politically, it is even more important. Members of Congress are those politicians closest to individual voters, including the almost four million Indian-Americans. No policy of the United States toward India is likely to flourish unless it has strong support in Congress. A strong role for Congress in U.S-India relations should be founded on a legislature’s first duty – namely to legislate. Legislation has not only the virtue of overcoming bureaucratic inertia but also of sending a strong political signal at home and abroad as to the direction and sincerity of U.S. policy. A case in point would be India as a permanent member of the United Nations Security Council. Under Obama, this was an explicit commitment of the United States, and this commitment has been reiterated under Trump. Congressional resolutions have been introduced on this subject in the past, but have gone nowhere. Stronger legislation endorsing the concept and providing instructions and reports on efforts to fulfill the U.S. commitment could go far to making this a priority. Moreover, it would send a strong signal to Indians as well as Americans that the U.S.-India partnership is intended to operate at the highest levels of international security engagement. The reality is that India still does not have access to equipment and technology at a level commensurate with that of the closest allies and partners of the United States, and cannot have it without congressional action. Representative George Holding, co-chair of the House Caucus on India and Indian-Americans, introduced legislation in the previous congress that would have amended the Arms Control Act to give India the same status for arms export purposes as the NATO countries plus five other of America’s close strategic partners (Japan, Australia, the Republic of Korea, Israel, and New Zealand). A similar bill was introduced in the Senate by Senator Mark Warner, co-chair of the Senate Caucus on India. Much of the language of the bills was included in Section 1292 of the National Defense Appropriations Act of 2017, including the designation of India as a “Major Defense Partner.” But the language for “NATO plus five” treatment was left out. This language should now be incorporated in new legislation that will put meat on the bones of the “Major Defense Partner” designation. Similarly, the vitality of Modi’s “Make in India” initiative as well as the drive to retain U.S. jobs in the defense sector can be enhanced by Congress. This would be a tremendous achievement in the face of what some consider a “zero sum” game of winners and losers. In India’s new procurement process for fighter aircraft, the Modi government is insisting there be manufacturing in India. America’s chief rival for a multi-billion dollar contract is Saab of Sweden, which is prepared to build its Gripen line of fighters in India. The United States, through Lockheed Martin, is contemplating matching the Saab/Sweden proposal by offering to transfer the entire production line for an advanced version of the F-16 from Texas to India. Fortuitously, this transfer would actually work to retain jobs in America because this production line has no more contracts to keep it running. A basic difficulty in transferring F-16 production to India is the myriad licenses needed on a technology-by-technology basis under current law. A similar difficulty would impede such other major joint undertakings. Among those that have been considered include those involving the F-18 for naval use, armed drones, or an aircraft carrier. This difficulty could be alleviated by legislation that would allow special comprehensive authorizations for “major projects” and “major programs” involving India. Such authorizations are now allowed for NATO countries plus Australia, Japan, and Sweden – but not India – under 22 CFR 126.4. Changes in the law could be combined with language specifically giving congressional impetus to the U.S.-India advanced F-16 or other such project. 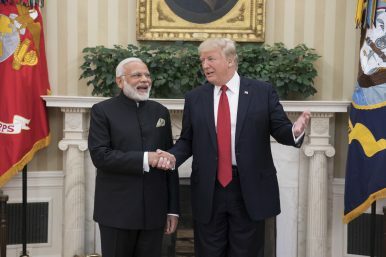 Such impetus may in turn lead to concluding the long-running negotiations for India and the United States to enter into the foundational agreements necessary for the flow of technology between the U.S. and India. Congress can also materially advance cooperation with India on fighting terrorism. For decades, India has advocated for a Comprehensive Convention on International Terrorism (CCIT). This convention would criminalize terrorist conduct whatever the rationale for committing terrorist acts. In the past the United States has been skeptical of such a convention. The Trump administration has now endorsed the convention. The convention has been under study for some time, and a number of changes have been made to accommodate U.S. concerns. The time is now ripe for the Congress to seize the initiative on this issue by a resolution endorsing negotiation of the CCIT. Strategic cooperation is often facilitated by other forms of engagement. Congress could make a major, and relatively uncontroversial, contribution to economic engagement by strengthening the status of Indians and others who come to this country for advanced studies in science, technology, engineering, and math (STEM). Legislation to provide lawful permanent resident (“green card”) status to foreigners who earn their doctorates in STEM subjects from U.S. universities is presently pending in the Congress. This legislation has widespread bipartisan support. Although it would not apply exclusively to Indians, Indians constitute the second largest category of such students. This legislation would send a strong signal not only to India but to Indian-Americans (many of whom came to the U.S. as STEM students) that America values the contributions that Indians and Indian-Americans make to our country. Thus, Congress can play a major role in strengthening the U.S.-India partnership. This strengthening is in the best interests of America and builds on a long history of progress under the Clinton, Bush, Obama, and now Trump administrations. A congressional role is consonant with the bipartisan support for the relationship, which has been strongly demonstrated by legislative action in the past. Congress in its present session can act in concrete terms on a legislative agenda that will serve to provide permanent strength to the relationship. This agenda can be built on legislation that will (1) renew America’s commitment to Indian permanent membership on the UN Security Council, (2) treat India at a level commensurate with that of the closest U.S. allies and partners, (3) criminalize terrorist conduct, and (4) provide concrete recognition of the contributions Indians and Indian Americans are making to our nation. The United States and India are the two greatest democracies on earth. It is imperative that they share a strong and enduring partnership. Congress has an important role to play in making sure this happens. Raymond E. Vickery, Jr., is a global fellow at the Woodrow Wilson Center and of counsel at Hogan Lovells. He is also a senior advisor at the Albright Stonebridge Group and a former U.S. Assistant Secretary of Commerce. Once again, Modi proves his skeptics wrong. It's Official: India's Modi Will Meet Trump At LastThe US-India-Japan Trilateral: Economic Foundation for a Grand StrategyModi's Big Speech in Washington: Time for 'Natural Allies' to Deliver Results5 Takeaways on US-India Relations After Modi's Meeting With ObamaDoes Obama Care About India?